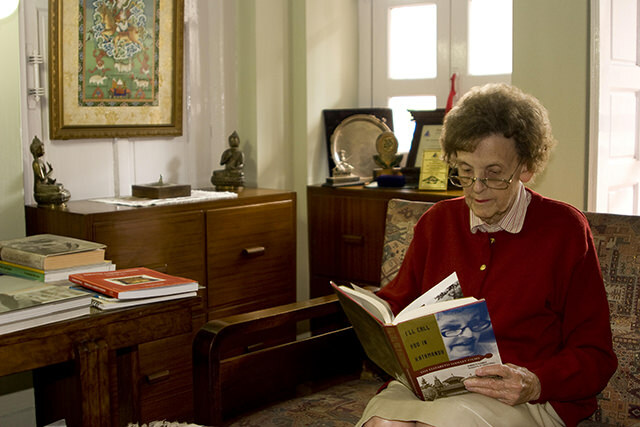 Elizabeth Hawley with her biography by Bernadette McDonald 'I'll Call You in Kathmandu'. Elizabeth Hawley, who died in Kathmandu on 26 January 2018 aged 94 years, was an American journalist living in Nepal since 1960, regarded as the undisputed authority on mountaineering in Nepal. She was famed worldwide as a ‘one-woman mountaineering institution’ because of her systematic compilation of a detailed Himalayan database of expeditions still maintained today by her team of volunteers, and published by the American Alpine Club. Respected for her astute political antennae and famously formidable, Miss Hawley represented Time Life and later Reuters since 1960 as Nepal correspondent. She is credited with mentoring reporters and setting journalistic standards in Nepal, competing to file stories from the communications-challenged Nepal of the 1960s. She worked with the pioneer adventure tourism operators, Tiger Tops, from its inception in 1965 with John Copeman, until she retired as AV Jim Edward’s trusted adviser in 2007. She managed the Himalayan Trust for Sir Edmund Hillary since it started in the mid-1960s, dispensing funds to build hospitals, schools, bridges, forest nurseries and scholarships for the people of the Everest region. Generations of Sherpas remember being overawed by the rigour of Miss Hawley’s interviews, and quake at the memory of her cross-examinations when collecting their scholarship funds. 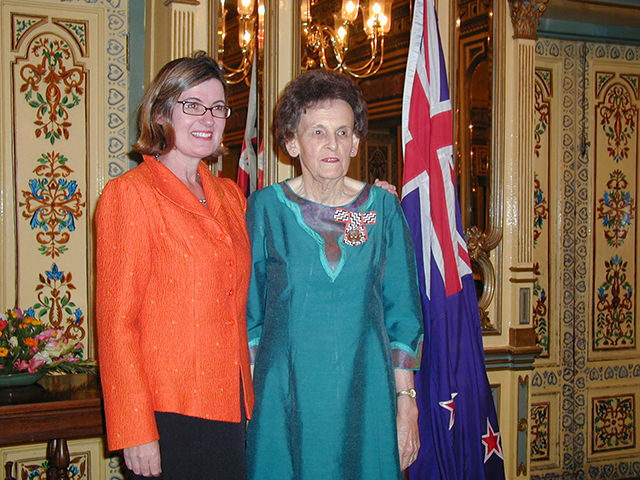 Hillary described Elizabeth Hawley as “a most remarkable person ... a woman of great courage and determination.” She served as New Zealand Honorary Consul to Nepal for 20 years until retiring in 2010. Elizabeth first came to Nepal via India for a couple of weeks in February 1959. She was on a two-year round the world trip that took her to Eastern Europe, the Middle East and South Asia. Bored with her job as researcher-reporter with Fortune magazine in New York, she had cashed her savings to travel as long as they lasted. Nepal had been on her mind since reading a 1955 New York Times article about the first tourists who visited the kingdom. 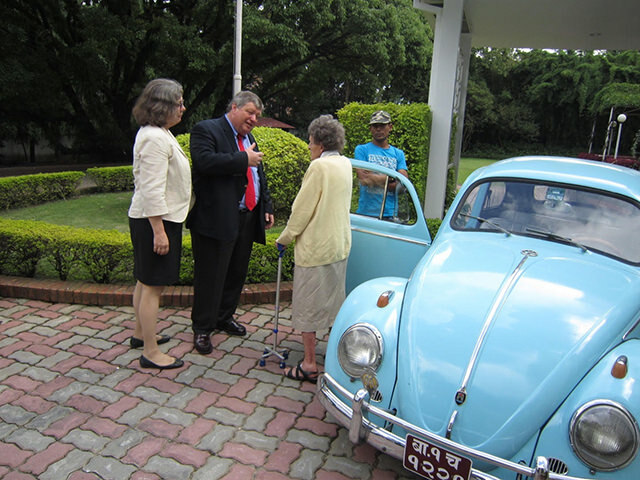 Elizabeth Hawley with the famous Blue VW Beetle, andUS Ambassador Peter and Tanya Bodde. Because of her media contacts, the Time Life Delhi bureau chief asked her to report on Nepal’s politics. It was an interesting time -- as one of only four foreign journalists, she was present when King Mahendra handed over the first parliamentary constitution, which paved the way for democracy in Nepal. Fascinated by Nepal’s politics and the idea of an isolated country emerging into the modern 20th century, she returned in 1960 and never left, living in the same Dilli Bazar apartment, the same blue Volkswagen Beetle car, and generations of faithful retainers. A diminutive figure of slight build with a keen look, Elizabeth was bemused at the universal attention she received. Her Himalayan Database expedition records are trusted by mountaineers, newswires, scholars, and climbing publications worldwide, published by Richard Salisbury and the American Alpine Club. She was one of only 25 honorary members of the Alpine Club of London, and has been formally recognised by the New Zealand Alpine Club and the Nepal Mountaineering Association. In 2004 she received the Queen's Service Medal for Public Services for her work as New Zealand honorary consul and executive officer of Sir Edmund Hillary’s Himalayan Trust. She was awarded the King Albert I Memorial Foundation medal and was the first recipient of the Sagarmatha National Award from the Government of Nepal. Elizabeth Hawley receiving the Queens Medal from NZ High Commissioner HE Caroline Mcdonald. Elizabeth did not suffer fools gladly. Though some mountaineers were intimidated by her interrogations -- sometimes jokingly referred to as an expedition's ‘second summit’, serious alpinists greatly admired her. "If I need information about climbing 8,000-meter peaks, I used to go to her," recalls Italian climbing legend Reinhold Messner. Nepali trek operator and environmentalist Dawa Steven Sherpa underlines the point: "Although it's the authorities that should have been doing this, they're not as strict or accurate as Miss Hawley. One of her biggest contributions is keeping mountaineers honest." 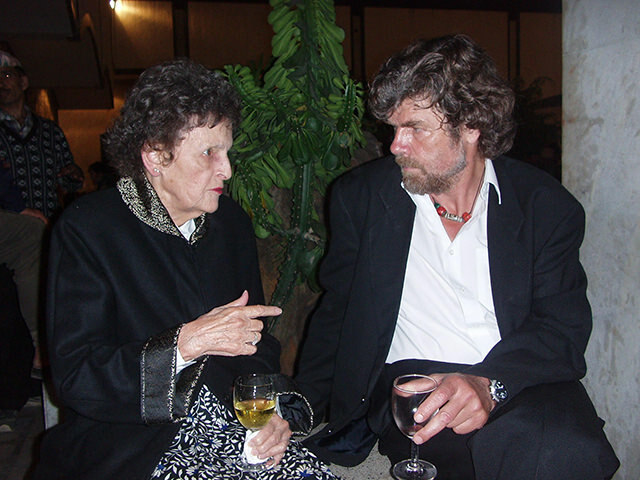 Elizabeth Hawley with mountaineering legend Reinhold Messner. Elizabeth applied her trademark scrupulous precision to summarising the political and development events in Nepal in her monthly diary, published in 2015 in two volumes as The Nepal Scene: Chronicles of Elizabeth Hawley 1988-2007. They stand as a faithful and unique historical record of the extraordinary changes that took place in Nepal over nearly two decades. Her enviable journalistic sources were based on long friendships with the political, panchayat and Rana elite. She had the confidence of a wide range of prominent Nepalis, and shared a hairdresser with the Queen. Educated as a historian, Elizabeth regarded herself as a reporter not a writer, stringently recording Nepal’s political and mountaineering facts with minimal opinion or analysis. Although there is no disguising her liberal bent and her admiration for the force of democracy. 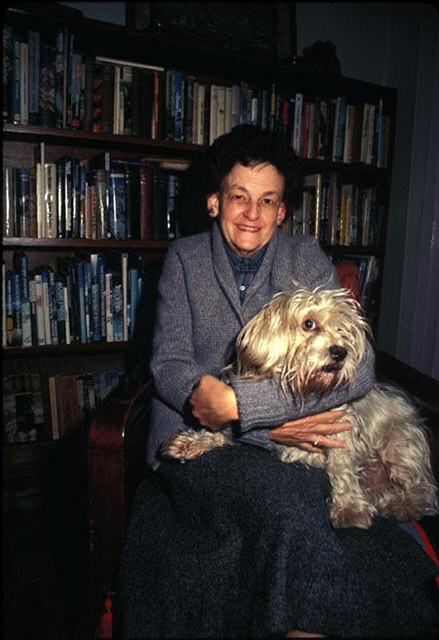 Hawley with her her dog Mallory in her home for 50 years in Dili Bazar, Kathmandu. Elizabeth Hawley’s achievements have featured in many books and articles about Nepal, and her biography by Bernadette McDonald, I’ll Call You in Kathmandu, was published in 2005, then updated and reprinted as Keeper of the Mountains. In 2013, to mark the 60th anniversary of the first ascent of Everest, Elizabeth was featured in the award-winning US television documentary of the same name, produced by Allison Otto. On screen in Keeper of the Mountains, her straightforward manner and fearless modesty made her something of a cult classic. In 2014 the Nepal government named a 6,182 m peak in honour of her contribution to mountaineering. Elizabeth was not impressed: "I thought it was just a joke. Mountains should not be named after people." Listen to the people and maybe youll learn something.